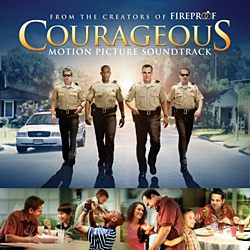 The soundtrack to go along with the newest release from Sherwood Pictures, Courageous! The purpose of Sherwood Pictures is to spread the gospel and the truth of God's Word to the world using movies that give audiences a picture of the cost and results of following Christ. Through drama, humor, and inspiration, we seek to tell stories that draw people of all ages to a closer walk with God. Sherwood Pictures has produced four films: Flywheel, Facing the Giants, Fireproof, and Courageous. They have been some of the most successful faith-based movies in history. In a partnership with Sony Pictures and Provident Films, the films have been distributed globally and are available in multiple languages. The two most recent, Fireproof and Courageous, opened in the top five in U.S. theaters. The unique partnership of a church-based film company with major studios like Provident Films and Sony Pictures will continue to impact people around the world. Sherwood Pictures has used entertainment to change lives. Sherwood Pictures pioneered a unique model, even for Christian filmmakers. The four movies, shot and produced in Albany, have been seen worldwide. The mostly volunteer cast and crew have been one of the great story lines of Sherwood Pictures. For more information, visit the Sherwood Pictures website.